Mari Mendivil discusses stereotypes associated with tattoos. Senior, Kelsie Wilcox-Laurel, shows off her new bumble bee tattoo. In 4th grade my friends and I would squeeze into chairs at a little table gaping over The Guinness Book of World Records. This jaw-dropping book had us shouting everything from “woah cool,” to “ewww!” The librarian would scold us for not using our “inside voices,” but how could we? Our tiny brains had no idea humans had so many talents and capabilities– no matter how odd they were. We’d stare in astonishment at pictures of the person with the longest nails. The sight made us giggle. Whether it was the woman with the largest afro, or a man with the biggest hamburger collection, this book proved to us that the impossible is possible. Looking back, I remember gazing at a picture of a man with the most tattoos on his body. The designs and shapes covered every surface from head to toe. When I’m out in public, I catch myself staring at the unique marks on people’s bodies. My thoughts roam around the idea of what it means to get a permanent symbol or picture marked on your skin. The question is, are people doing it for the look or for the meaning? They certainly aren’t getting it for the pain. Senior Kelsie Wilcox-Laurel shares her experience with tattoos. Not too long ago, Kelsie turned eighteen and she’s already gotten five tattoos. She shares that she thought people were going to judge her for something as simple as ink on her skin. “I wanted them since I was younger, and they aren’t necessarily for other people. They are for me and when I look at them, they make me feel happier and more confident. Despite the fact that I feel kind of insecure with them around adults, who are probably judging me for getting them because they will be there forever and what not,” Wilcox shared. Her perspective and personal thoughts intrigued me to ask an adult what their outlook on tattoos is. 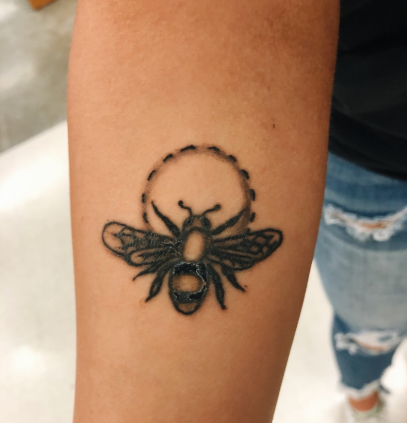 Kelsie and Mrs. Stamer can both agree that tattoos can be a symbol of meaning that can reveal thoughts and the way people express themselves through ink. “Once I started getting more I just got more interested in the artwork behind them. I have a very fair mixture of both: I just like this [and others have] great meaning to me,” Stamer commented. My younger self never understood the depth and meaning of tattoos, but I now marvel at them and how bold it makes people look. They show personality and stories. Tattoos are a form of expression, and as I’ve gotten older I have realized that people who have tattoos have different stories behind the work of art on their bodies. Tattoos make a statement of individuality.